Hawthorne is a quantitative ecologist working on conservation and environmental management problems. 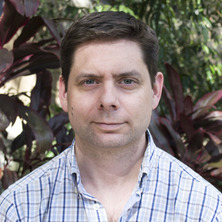 His research focuses on i) the dynamics and control of wildlife disease and vectors of disease (rabies in East Africa, ticks in Canada, and now coinfection in koalas in Queensland); ii) mechanistic animal movememt models that quntify habitat and movement processes in a single unified framework; and iii) optimisation of resource allocation to ecological management problems. After being awarded his PhD from the University of Glasgow in 2010, he worked as a research fellow in Prof. Marie-Josee Fortin's lab at the University of Toronto for 18 months before joining Prof. Hugh Possingham's group at UQ. Hawthorne is now an ARC DECRA research fellow based in the Centre for Biodiversity & Conservation Science in the Department of Biological Sciences at UQ. Hawthorne's work outside of the realm of Academia include developing free software to facilitate geospatial modelling and analysis ('Hawthstools' and the Geospatial Modelling Environment) that have been downloaded over 180,000 times. Tisdell, Clem, Preece, Harriet, Abdullah, Sabah and Beyer, Hawthorne (2015). Parochial conservation practices and the decline of the koala - a draft. Economics, Ecology and Environment 200, School of Economics, The University of Queensland.